Rare Exports | Anime etc. 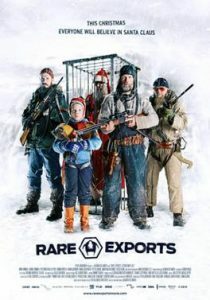 Rare Exports: A Christmas Tale is a completely different kind of “horror.” Directed by newcomer Jalmari Helander, it’s close – though perhaps not close enough, commercially speaking – to Joe Dante fare such as Gremlins and his new The Hole. A Grimm fairy tale framed through a child’s eyes, Rare Exports hails from Finland and makes fine use of that country’s icy, looming mountainscape. The backdrop is even chillier than Let Me In/Let the Right One In, and the cast has veritable forests of shaggy facial hair. This, we’re told, is the home of the real Santa Claus, a monster likelier to be grinding infants’ bones than swigging Coca-Cola. As a film, Rare Exports sits in a strange genre crevice between a spooky kids’ adventure and an actual horror film. The BBFC has rated it “15,” which still seems weird to me after the notorious “12” for The Dark Knight (with its vanishing pencil). Undoubtedly, one fear was that parents might take their toddlers to Rare Exports expecting The Santa Clause 4. (Gremlins was rated “15” too, back in its day, probably out of fear that some twit would mistake it for E.T.) Rare Exports has subtitled f-words which could have been easily erased, and fleeting violence which could have been even more fleeting. But it also has more pervasive and disturbing things in it. The film is about sinister grown-ups who really are child-eating monsters; on a child trauma scale, it’s several notches over the film of Roald Dahl’s The Witches. How it measures against, say, a Gremlin exploding into goop in a microwave is harder to judge. The film is the tale of a little Finnish boy called Pietari who lives in a remote stretch of wilderness, and his growing fears that the foreign digging team on the nearby mountain has unearthed the Cthulhu-like Santa. Like The Hole, the film’s a slow-builder, concentrating on Pietari’s relationships with his harsh widowed father (there’s an especially agonising supper scene) and his supercilious preteen “friend” who gets him ever deeper into trouble. Meanwhile Helander has fun subverting Christmas icons, from reindeer (a herd is found slaughtered) to advent calendars (Pietari staples his shut) to large sacks (well, you can guess). The stakes are raised cleverly, with our mid-film disappointment of “Is that all it is?” giving way to pleasurable suspense as it turns out that no, it’s certainly not. The last payoff is rather wonderful, involving Pietari’s dreamlike flight above Finnish forests in a snowstorm, drawing Yuletide monstrosities behind him. It doesn’t matter if the CGI is cheap; it has the quality of the creepy kids’ picture-books which figured heavily in the early scenes. Rare Exports will also disappoint gorehounds expecting a catalogue of Christmas splatter like Silent Night Deadly Night or Santa’s Slay. However, anyone prepared for something Grimm and Gilliamesque should love it. It’s not Gremlins (which had the ultimate feelbad Santa speech, delivered by Phoebe Cates) but it’s far better than The Hole. One footnote: Rare Exports grew out of a couple of short films (Rare Exports Inc), also directed by Helander, and they’re easily findable online. Like the feature, they’re well imagined and skilfully executed, but they give lots of the film’s ideas away, so watch them after or instead.